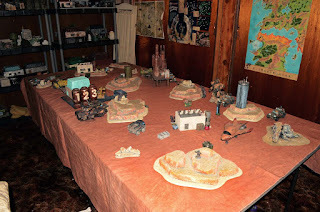 Nate Miller's Tabletop Games: 3000 point No Limits battle for the Station 42 War in progress! 3000 point No Limits battle for the Station 42 War in progress! Just wanted to post a preview shot of the "Station 42 War" battle we have in progress. This is a 3000 point No Limits battle and it is so far the largest we have had in the campaign so far. We started with over 100 models on the table including 10 armored vehicles and two mecha units. Everything on the table is painted and we scratch built almost all of the terrain. This has been the goal of our Station 42 sci-fi project and we are really happy we are finally able to play these types of games again. This battle is currently still in progress on turn 6. We hope to finish it tomorrow.